It may be that you only want to draw monsters and think that human figure drawing is a waste of time, but the basic principles of proportion and balance apply whether you're drawing a pretty girl or a hideous alien. Marvel Comics in particular enjoyed subverting the cliched roles of ugly villains and handsome heroes. 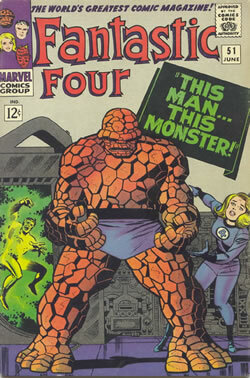 One of their most enduring good guys is the loveable but ugly Thing from the equally enduring Fantastic Four comic. But usually the hero is drawn as a taller than average figure and there are ways of getting a character's height across to the reader - either by standing them next to secondary (smaller) people or everyday objects. 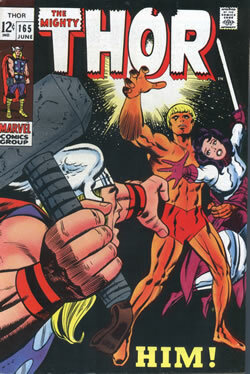 This cover by Marvel's Jack Kirby depicts The Thing's strength by drawing his figure in a stable, triangular shape, feet planted wide apart to form a solid base. 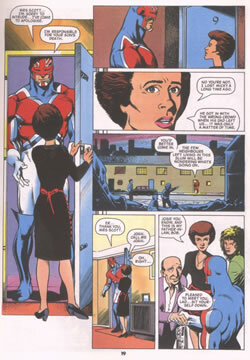 This brilliant depiction of Captain Britain from the UK published Mighty World of Marvel by Alan Davis frames the character in a normal size doorway to convey just how tall he is (about 6'8", by my reckoning).